Celtic ring is cast in sterling silver and features a Connemara marble setting in the center that is surrounded by a knot-work design. This sterling silver Celtic ring features Connemara marble in the center that is surrounded by a filigree knot-work design that includes the Trinity. The Irish ring is augmented with an additional filigree Trinity knots on each side and the face measures 5/8” wide x 7/8” tall. This piece of Irish jewelry is gift boxed with Celtic knot and Connemara marble history cards, complements of The Irish Gift House. 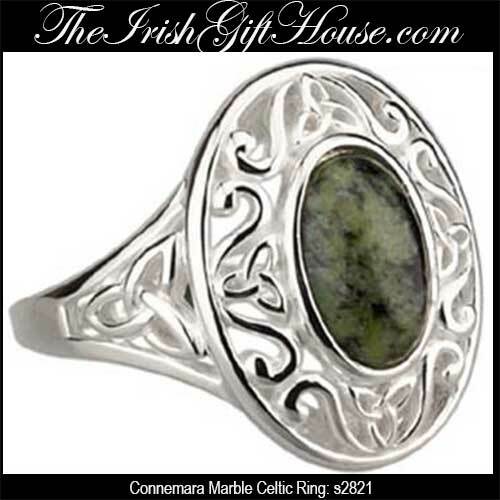 The Connemara marble Celtic ring is made by Solvar Jewelry in Dublin, Ireland and it is part of their Fáilte Ireland Collection. This women's Celtic ring is available in limited sizes.